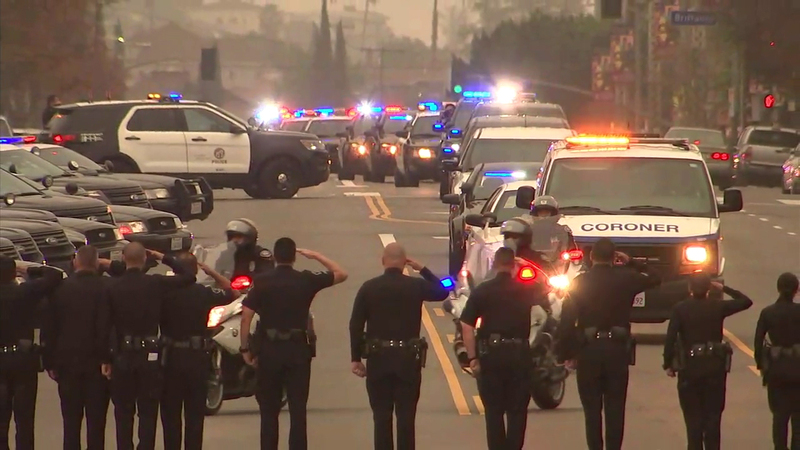 POMONA, California -- A Pomona Police Department officer in Los Angeles County has died and another has been hospitalized after both were shot during an ongoing standoff with an armed suspect, officials announced early Saturday morning. "It is with a heavy heart that I must report that one officer did not survive," Police Chief Michael Olivieri said on Twitter. "The second officer is in stable condition." The officers' names were not immediately released. The shooting happened about 9 p.m. Friday in the 1400 block of Palomares Street, near Fernleaf Avenue, where officers responded to a report of a barricaded suspect at an apartment complex. Neighbors said they heard a fusillade of gunfire after a police chase that had originated in the Inland Empire ended in a crash at the scene. A mangled truck was seen outside the apartment building. Two officers were struck in the apparent shootout; one of them was shot in the head and was seen being carried to safety by his colleagues. Both officers were transported to Pomona Valley Hospital Medical Center, where the one who suffered the head wound died. That policeman was being escorted by law enforcement personnel and firefighter to the Los Angeles County coroner's office as the barricade situation continued at the scene.